The Platyplex for English house and Hindi घर (ghar). Suppose that we want to translate the English word house into Hindi. The database can look for sources that explicitly translate this word into Hindi. We call translations that are found in this way “distance-1” translations. The PanLex Database in fact contains many sources attesting a distance-1 translation of house into the Hindi word घर (ghar). An example is PanLex source 807, The Student’s Practical English–Hindi Dictionary (Ram Narain Lal, 1936). The PanLex Database has more than a billion distance-1 translations, but we need not stop there. Distance-1 translations are not always available, or high enough quality, for every word or pair of languages. Our database has the powerful feature to infer “distance-2” translations by combining translations from two different sources. To do so, the database first finds all available distance-1 translations of house into all available languages (not just Hindi). It then looks for distance-1 translations of these “pivot” words into Hindi. Each possible path from English word to pivot word to Hindi word supports a distance-2 translation. We have found that with large amounts of data and good ranking algorithms, distance-2 translations are quite accurate. The PanLex Translator app displays both distance-1 and distance-2 translations. If you click the three-dot icon next to a translation, it produces a translation visualization that we have dubbed the Platyplex. Above you can see the Platyplex for house to घर (ghar). The bold arrow in the middle indicates that a distance-1 translation is available. 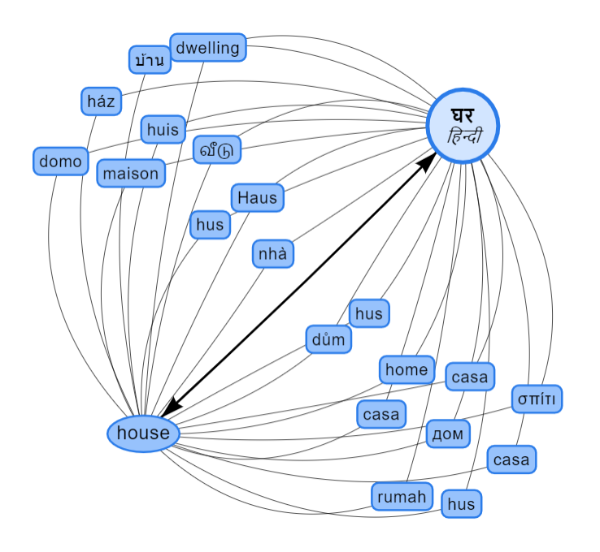 It also displays 20 of the distance-2 pivot words that lead from house to घर (ghar). These include French maison, Tamil வீடு (Vīṭu), and Indonesian rumah. 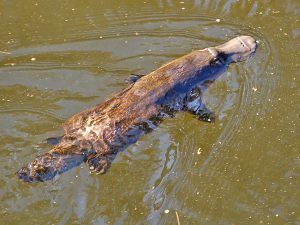 The name Platyplex is inspired by the “distance-2” nature of the platypus, an animal that (to non-specialists) seems conceptually midway between a bird and a mammal. We have found the Platyplex to be useful in exploring the PanLex Database and its translations. Try it out, and move it around – it swims!